“Blue donkeys,” as they are known locally, are one of the primary modes of transport in Addis Ababa, Ethiopia. Photo by Overseas Development Institute/Flickr. 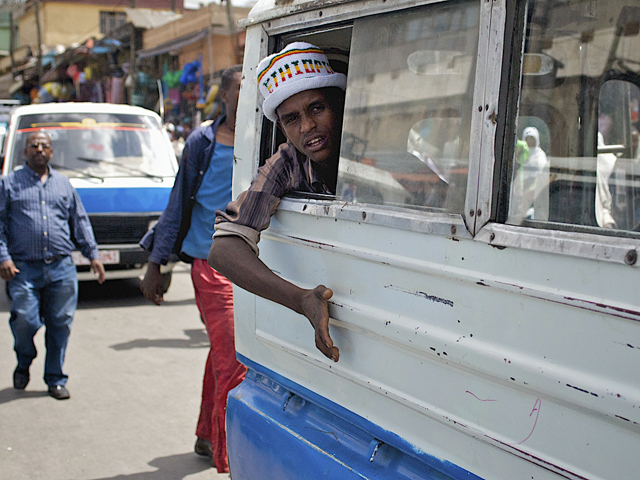 Addis Ababa, the capital city of Ethiopia, is one of the fastest growing cities in Africa. In fact, it’s population has almost tripled since 1970. In its rapid race towards development, little space was left for parks, little consideration was given to the role of public spaces, and no mass transport infrastructure unites the distinct neighborhoods of the city. The city as it stands now is one with a million different story lines, with each resident taking private cars, taxis, or the occasional bus to their own private meeting places. Yet, some are fighting to change this situation. Ethiopia Skate, a grassroots organization that teaches low-income youth how to skateboard, is turning skating into a legitimate transport option – one that is cheap, sustainable, and promotes a sense of community. However, even as skating is growing as a transport option, the group’s repurposing of the city shows the continuing need to build dedicated places for community and play. The main forms of transport in Addis are blue and white taxis. Much like unsteady elephants, they weave and dance in a stomach-turning dance down the road, leaving no room for pedestrians. The blaring tune of horns and shouts from Wayalas, who ride in the taxis to collect fares and announce the taxi’s destination, mingle with the sun and the dust. The taxis and the roadway are not so much transport options as miniature battlegrounds; people fight their way on, fight to have their destination heard, and fight to get off. The city has tried to introduce more buses and systemize the taxi system, but here, too, there are fights. It is said a new rail system is coming, but with the companionship of the sun and in an endlessly growing taxi line, mass transport seems about as far away as snow. Sixteen year-old founder of Ethiopia Skate Abenezer Temesgen believes there is another option to solve the city’s mobility problems while simultaneously building community. For low-income children who cannot afford bicycles, yet still need to access education and job opportunities, skating can get them to where they need to be just a little faster. Added to this, skating demands practice, it demands a community to learn from, and it promotes a healthy, active lifestyle. Temesgen right now is collaborating with his team to build a ramp that can move around the city so his group can teach lessons and get children excited about skating. His next step is to organize global sponsors to help create Addis’ first skate park. For now, the skate park is an IndieGoGo campaign and a dream. At the same time, skater Oscar Candon and photographer Kevin Metallier document their skating journey around Addis in their video Ethiopia by Skate. The video is beautiful as these men show the city in a new light, as seemingly ordinary benches and staircases turn into slides and jungle gyms. Yet, hanging over the beauty of the video is the knowledge that these people have nowhere else to go to practice. It is a journey simultaneously of exaltation at the joy of movement and pride for the city, yet with constant knowledge that this pride lies more in the city’s potential than in its reality. Addis needs to turn this energy for community, for vibrant public spaces, and personalized yet inexpensive transport, into action. The benefits for incorporating mass transport and public parks into the city are vast, as both can mitigate climate change, reduce congestion, and improve mobility. Addis has the example of many cities to follow, from the Parque Madureira in Brazil to Chapultepec Park in Mexico. Yet if Temesgen has anything to do with it, Addis is not likely to follow Brazil and Mexico. It is likely to lead in building public spaces, but in its own way.